Model Graphix #352 (published in January 2014 with a March cover date) contained a major cover story on Yamato 2199 that set a record with an impressive 36 pages (see them all here). It included an extensive 4-page interview with Yutaka Izubuchi, his first since the conclusion of 2199. Here, he shares his perspective at the end of one road and the beginning of the next. Footnotes that originally followed the article have been incorporated into the text. It is a little under two years since the start of Space Battleship Yamato 2199. Production of a feature was announced, and the challenge of an interview with general director Yutaka Izubuchi was a new voyage realized at last. Living up to this magazine’s critically-acclaimed example, we talked for a solid two hours about the battleship called Yamato, the planning of 2199, and the love of the Yamato series. What did Yutaka Izubuchi achieve by bravely taking on a remake of the first Yamato? All hands, attention! Interviewer: Is this the first time you’ve seen a published example of this magazine? Izubuchi: It’s the first time. Hey, you use dim lighting? The dim lighting is very nice. The light of a console reflects in a helmet visor. I’ll buy a copy of the Model Graphix where this example appears for my own pocket. The photos in Model Graphix have the feel of a live-action prop. Rather than simple photos, there is is a sense of reality. The reputation is good among the 2199 staff. Interviewer: I brought test shots of the 1/500 Yamato today. Izubuchi: That’s one hell of a straight-build, huh? I’m looking forward to the examples. The 1/500 seemed to be a good seller. In both size and price, it’s definitely an item that wives won’t allow in the house. Interviewer: Doesn’t Bandai send you the kits? Izubuchi: Indeed, they send me a pre-assembled product. I never have the time and space to build them myself. Interviewer: Was this 1/500 kit made under your supervision? Izubuchi: No, I asked Junichiro Tamamori to supervise it rather than me. After all, the supervision of a model kit should be the duty of the designer. Mr. Tamamori himself is someone who builds models. I’d be annoying if I tried to get all the details of the designs incorporate into a model. So I had Mr. Tamamori decide which details the model would make use of. Interviewer: Did you build Yamato kits from the original works? Izubuchi: No, I dabbled in scale models, such as tanks, but I didn’t build character models much. [Translator’s note: “character models” is the catchall term for models based on fictional vehicles such as spaceships and robots.] After all, even the Yamato plamodels couldn’t completely escape being children’s products at the time. Anyway, I wanted to build proper scale models. Note 1: Released as the “Bandai Mascomi Series” in 1974. It was reissued after the windup motor was eliminated and a third bridge was reproduced. Note 2: A unique large-scale model with a deformed bow. Released in 1977. Though it went through several design changes, it is still available. Bandai previously released a 1/350 kit. [note 3] There were various Yamatos before that. They drew from designs by Kazutaka Miyatake and probably Naoyuki Katoh depending on the pass, and later there was Katsumi Itabashi’s version. Also, Makoto Kobayashi designed it for Resurrection, and it became wider like the real battleship Yamato. It was different from animators’ swipes. Note 3: An extravagant kit released in 2007. Gimmicks included a motor, built-in LEDs, and sound effects. If you were to look for a unified image of Yamato in the first work, such a thing couldn’t be found. There was also the cool Yamato drawn by Kazuhide Tomonaga [animator of the original launch scene and Rainbow Star Cluster battle], and Yamatos drawn by people who weren’t very good at mecha. The Yamato that looms from front to back was drawn by Kaoru Izumiguchi [Series 1 animation director; he animated the key flyby scene in the opening title]. For people who watched in those days, the strongest image was probably Tomonaga’s Yamato and Izumiguchi’s Yamato. But if it was said that any two people drew Yamato alike, the features were different. Interviewer: What was happening with Yamato 2199 at the time? Izubuchi: The planning was moving forward, but it wasn’t time yet to make the information public. There were some problems that had to be cleared up, and the formal go-sign was not yet given. Interviewer: Had the mecha design work started? Izubuchi: It had begun. This was because if we waited for the go-sign, it would be too late. It was done on the determination that “realization is required for this project,” or the hardships would be tripled afterward, not just doubled. (Laughs) Anyway, if the script and mecha design didn’t go ahead, it would be too late for the CG modeling work. As I said before, since the image of the ship was done by a scattering of individuals, it was a prerequisite to make it with CG. Also, the original version had the luck of being well-drawn by hand in those days, but when it comes to people being able to draw the same way now, it is considerably limited. If it were hand-drawn today, it would be impossible unless you subtracted some information from the mecha design, and even if you did that it would be difficult to support it with the resources of a limited talent pool. In the end, it became clear that the intro shots would be limited, we wouldn’t be able to make a bold presentation, and we would be expending a lot of effort for limited returns. Therefore, it is no exaggeration to say that this remake depended on the development of CG technology. Junichiro Tamamori took charge of design refinement, and [chief mechanical director] Masanori Nishii and I had to reach a consensus on how to reproduce the amount of information and show elaborate texture without feeding the camera too much. I think the scenery incorporates a more diorama-like sensibility. Since there’s an important carry-in port by the pulse lasers where the work barges dock…I’m always thinking about what kinds of scenes would be good to do. One compass needle to keep me on the path was to make notes, asking questions like, “Would that really be there?” or “On a ship that was really this size, the interior would be about this size” and such. Since it’s a battleship that travels 168,000 light years, I wanted the audience to get the feeling of going on the voyage together. 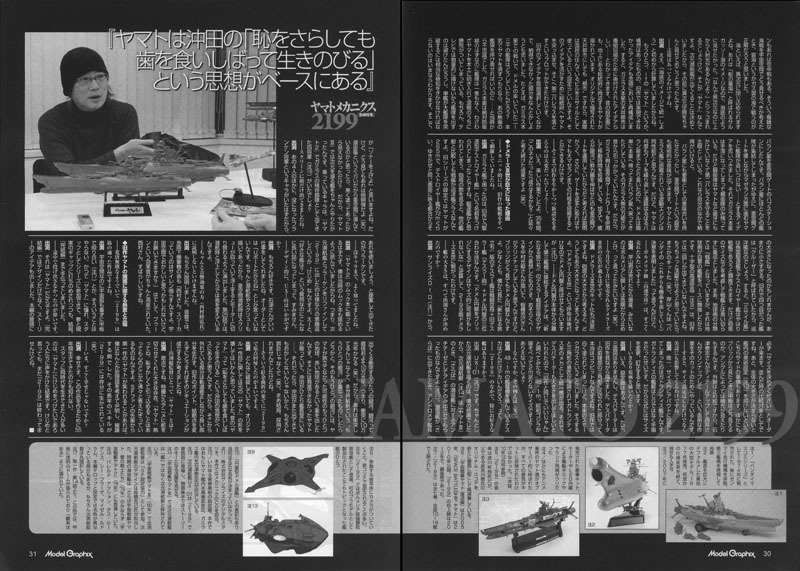 I read a previous interview with Kazutaka Miyatake about the original Yamato, and it seems the practice was to double the considered size for the interior set designs. The observation domes on both sides of the ship were like a hotel ballroom…they were designed by Kenichi Matsuzaki of Studio Nue. This time Mr. Miyatake helped us with the image of the megastructure (he was credited for conceptual design collaboration), and Mr. Katoh painted the Blu-ray sleeves. Having two people participate who built the original image of Yamato was a very big thing to me. Having Mitusuru Kashiwabara’s sound effects and Mr. Miyagawa’s music [note 5] and two people participating from Studio Nue, there was the feeling that this wouldn’t be just an imitation of Yamato. It felt like a longtime dream finally coming true. Note 5: The music of 2199 is by Akira Miyagawa, who revived the original score by his father, the late Hiroshi Miyagawa, and remastered it for a new performance. Izubuchi: That wasn’t it at all. Interviewer: It was based on the original work from start to finish? Izubuchi: It was compliant. However, in the world at large, the content of Yamato was considered to be something watched only by devotees, a layer that has steadily narrowed and also grown older…that was the perception. The order I received was not to “make a new continuation of Yamato,” but to instead do a remake of the original. CG technology had progressed to a good condition, and I thought it would probably be the last chance to do a remake of Yamato. As a result, Yamato 2199 became a work that was blessed with a variety of good luck. In a historic sense, the timing was right, and we were also able to assemble the best staff. Looking back, you realize, “The time was right, so we could do it.” I guess you could say it turned out to be a good confluence of events. From the beginning, the plan was for a triple set of 2199, Resurrection, and the live-action movie. 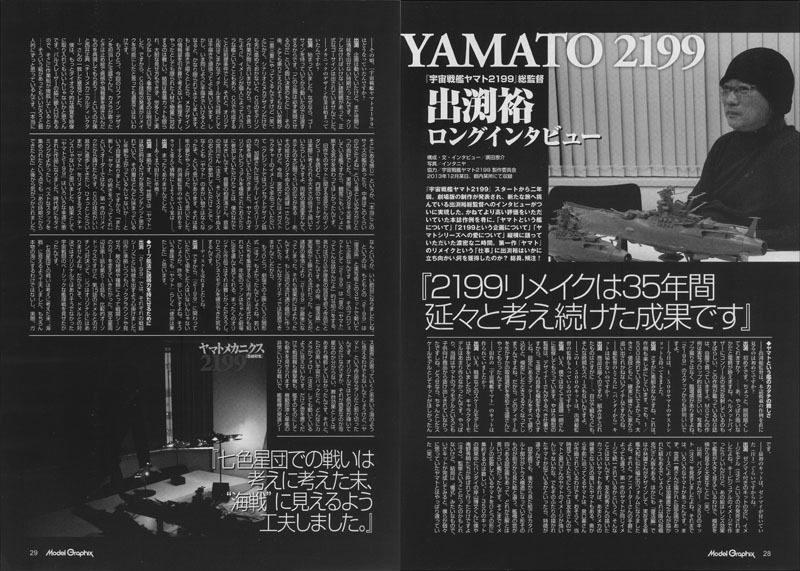 [note 6] For that project, 2199 was meant as the shock troops to introduce people to the old story and say, “This is what old Yamato was like.” The flow was going to be that Resurrection and the live-action movie would appear afterward, but due to various circumstances, 2199 came last. This also had a good result. If it had been the first product of this flow, it couldn’t possibly have been done with such quality. Note 6: Yamato Resurrection was released in 2009 and the live-action movie in 2010. Yamato 2199 premiered in 2012. Another good thing was releasing it in the form of theatrical screenings. [note 7] Although that format may not be suitable to attract young people, it was perfect for the older fans to go see it in a theater. It would have been difficult with an entirely original work, and it was felt that a business model could be established like that. Note 7: All seven chapters of 2199 were screened in 10-16 theaters across the country. Interviewer: It came out on disc, too. Izubuchi: Therefore, nobody was left out with 2199. That’s a rare thing, nowadays. In that way, I think the “mission was accomplished” like that of Yamato. Izubuchi: In 2199, we took care to bring out special characteristics in each battle scene. While being based on the original’s background and appearance, I wanted to change the tone of the battle scenes in terms of scale and the type of enemy. The area around Pluto in the first episode and episodes 5 and 6 was comparatively orthodox, but the over-the-top confrontation with Domel in Episode 15 was actually not in the original. I wanted to show the basics of fleet warfare in space combat in a way that was unlike the original confrontation with Domel. After careful consideration, the battle of the Rainbow Star Cluster was devised to look like a “naval battle.” Of course, it doesn’t happen in a real sea, and when we approach the gas nebula it doesn’t look like a sea, but it had to be like that if it was a work called Yamato. In the original the stars just shine in seven colors, but it wasn’t understood whether they were planets or fixed stars. As a stage effect, it didn’t have much function. At the same time, if the background space was just black, it wouldn’t seem to move much even with a follow. [note 8] But if you put fighters and bombers and the ship itself against clouds, you can show movement. It’s a very irregular battle between a mechanized unit and a single battleship, starting with scenes of aircraft launching and an aerial dogfight. While thinking about how to show such a complicated battle in space, I thought the correct answer would be to fight in a sea of clouds, or nebulae. Note 8: Follow – A camera tracking with a moving subject. It is often specified in the storyboard. Speaking of the sea, there’s one trapped in a different dimension. Because it has the image of a Sargasso Sea called “the graveyard of ships,” I wanted it to look like it was under water. Some might ask “why is there incidental light from above in a different dimension,” but that’s Yamato. Because I had decided that the dimensional submarine would appear, I wanted to properly show the different dimension of space first. Izubuchi: Yes, it was intended to “unify the undersea image.” Another “if it’s Yamato…” so to speak was the idea, but I reconstituted ideas that couldn’t be achieved in the original. It was understood that idea of the hanging city on planet Gamilas seemed to be retrofitted to shorten the series. In the old design sheets, Yamato was drawn closing in on the presidential tower on the ground. Because it is a “city,” even if it was made into a hanging city in the original, the concept actually seems to be that people live in buildings that get used as missiles. We took advantage of the idea by having Yamato charge into the presidential tower and came up with the plot of dropping Second Balerus. When I sifted through the ideas of the original, I wanted to do something about the parts that were not convincing. For example, in the battle at planet Gamilas, why wasn’t there a fleet of two or three thousand ships that Domel commanded? If you seriously intended to smash Yamato, you would call that fearsome fleet together…it was a mystery from the old days. There should be the absolute defense line at Gamilas, but there wasn’t a single fleet ship, so it was as if victory or defeat turned on a single melee in which Yamato was specially invited to the mainland. Of course, they had to avoid showing a fleet since they didn’t have the resources to draw it for TV, but if you saw it today you’d think a single ship breaking through a grand fleet would have to use considerable wit. Therefore, we made planet Balun the hub station of a sub-space gate. Although most of the fleet has gathered at Balun, they couldn’t catch up with Yamato after it destroys the sub-space gate and proceeds toward the Magellanic Cloud…I came up with that idea. That only left a few guard units to protect Garmillas. However, the guards don’t have the teeth to go up against Yamato, and they mainly protect Second Balerus. That was a convincing arrangement. I wanted to give planet Balun the implication of being an important strategic point, and the concept of a sub-space gate gave it a tactical sense. I think the Wave-Motion Engine on Yamato and the Garmillas ships have the same ability. But Yamato reached all the way to Balun by repeated warping. Domel easily travels between Balun and the homeworld. The Garmillas side has had that sort of omnipotence since the old days. So, the Garmillas side uses the sub-space gate and warping together to shorten travel time. Also, when you consider that their sphere of influence extends across the galaxy, the sub-space gate gives it an explanation. Furthermore, if Yamato turned the gate to its own advantage, it could shorten the distance to the Large Magellanic Cloud. Interviewer: In terms of mecha, you covered all the ships from the original. Izubuchi: While planning the Garmillas ships, the name “Destroyer-type warship” was inherited from the original. I thought about whether it was actually a destroyer. If you look at the number of gun turrets and compare them with other warships, they’re in a battleship or battle cruiser class. In the designs for the old series, Yamato is 265 meters long, and the destroyer warship is about 72 meters. That size may have been chosen for convenience since it was on screen with the Yukikaze, but it’s too small. Because the four-eyed warship in the original was called a “cruiser,” it would be a battle cruiser. Then if the destroyer is a battleship, you can infer that the “missile ship” would be a torpedo destroyer. However, considering the size of the gun turrets, it’s more rightly a heavy cruiser than a battleship. Well, it becomes a “battleship” according to the classification of the Earth side, because the Earth side judged it by the warships at the allied base. Note 9: In 2199, the high-speed carrier is specified as the Pormelia-class astro assault carrier. It was a ship that became a topic after it became one of the first to be made as a plamodel. Interviewer: Did the Pormelia-class [high-speed carrier] seem to sell well? Interviewer: The ad for the Domelus III to be released in July should appear in this issue. Izubuchi: A kit of the Domelus III was “decided.” I thought about it based on the size of the gun turret, and it just ended up that size. The Domelus III was retrofitted with what I call the Domel disc [note 10]. The idea is that the Domel disc separates from the main part and attaches to the third bridge, and it was inspired by the design of Dessler’s battle carrier in The New Voyage. Mitsuki Nakamura probably did the basic design and I think Katsumi Itabashi did the cleanup, and that’s what the Domel disc bridge looks like. To me the New Voyage version of Dessler’s ship looks like a trinity of the battle carrier plus the old Dessler battleship [as the Dessler gun] and the Domel disc. I thought, “a design that uses the Domel disc as a bridge gives a basis for size,” and I counted backward to bring the 2199 version of Domelus III to life. Interviewer: Did you decide on the sizes of all the warships? Izubuchi: The order came from Sunrise D.I.D. [note 11] to “please decide on the sizes.” It was for comparison when they’re lined up. There was also the situation on this side where I couldn’t describe the design concepts [note 12] if the overall size was not decided upon. In addition, how does the deck look from the bridge, how does the bow look according to the angle. Since the exterior was a still image, Horishi Ishizu increased the detail, and Mr. Nishii did cleanup…that’s how much work went into getting the shots. Note 11: The digital studio of Sunrise Co., Ltd. They were in charge of CG mecha for this production. Note 12: The designs for ship interiors. In this production, Takeshi Takakura mainly did interiors for Yamato, and Yasushi Ishizu took charge of interiors for Garmillas warships. Interviewer: Then, the size setting influences not only the CG, but also the appearance. Izubuchi: The only ones we just sort guessed at the size with were the Gatlantis ships. The warships of Gatlantis were hand-drawn rather than being done in CG. Therefore, I officially changed the size to correct it. Interviewer: Was the animation drawn spontaneously? Izubuchi: No, there were design images. However, when I went through the original works, there was no three-view drawing for the Devastator [fighter]. The part divided into a triangle on the leading edge of the Devastator is really the cockpit. It was painted white in the original, but we made it into smoked glass. The triangle design gives a sense of unity to the mecha of Gatlantis. So because I thought, “it would be good to make it the same as the original,” I wanted to give the Devastator a size, and I figured it to be 48.1 meters. Could it be just two meters short of the Showa Gojira [60s/70s Godzilla] lying down? Izubuchi: Naska has gained a pretty big ship if it can accomodate 48.1 meter aircraft. Interviewer: Do you have a particularly favorite ship from 2199? Izubuchi: The UX-01. [note 13] Because it was my long-cherished wish to draw a proper dimensional submarine. When the dimensional submarine appeared in Yamato III [note 14], the idea was just an antithesis of the space submarines in Farewell to Yamato. [note 15] When the space subs appear in Farewell, the Andromeda captain says, “raise the sonar.” But no matter how you look at it, it’s just a flare. (Laughs) If you think about a ship called a space submarine hiding in sub-space, is it only invisible because it’s painted black? Note 13: The Dimensional Submarine UX-01 appeared in several episodes of 2199 and played a pivotal role in the second half. Note 15: Director Izubuchi participated as “SF concept collaborator” in Yamato III (1980). Katsumi Itabashi was in charge of the design for the Dimensional Submarine. The space submarines appeared not only in Farewell to Yamato (1978) but also Yamato 2 (1978). I wanted to do a ship that properly dove into another dimension in Yamato III. The characters who rode on it would have been the four generals who appeared as a residual military unit of Gamilas in Yamato 2. [note 16]. Interviewer: Only their faces appeared on screen. Interviewer: You know a lot, even about the dead characters. Interviewer: How about the design of UX-01? Izubuchi: Of course I like it. Mr. Ishizu did a good job. I didn’t actually issue an order to “make it a U-boat.” Because the submarine rudder and screw were drawn properly, I directed it so the screw would turn as the submarine surfaced and then switch over to the motor. In Episode 25, I changed the sound when it emerges from a dive. Interviewer: Did you explain that to Mutsuhiro Nishimura, who did the sound effects? Izubuchi: Of course I explained it. For the sound of the dive bomber, I said, “Mr. Nishimura, it sounds like the wail of a Stuka. Can I have that even though you might think it’s strange in outer space?” In the end a perfect “bwaaaan” sound was prepared. Great job, Nishimura-san. Interviewer: Despite its essential absurdity, 2199 is a very logical series. Izubuchi: Though it’s in outer space, there was a fist fight on the deck without space suits [note 17]. I didn’t do things like that. I once longed to be able to participate in the Yamato series as a staff member and I did cross the gap between dream and reality. After all, I helped out on Final Yamato. Interviewer: It’s great that you didn’t give up. Izubuchi: That’s because it’s Yamato. I did not only design for Final Yamato, but also story ideas. Two galaxies collide at the beginning of the story. The Milky Way is approximately 100,000 light years in diameter. So in other words, the collision would take about 100,000 years. (Laughs) I proposed that, rather than a collision, “another Milky Way galaxy,” like a parallel world sort of thing, was overlapping onto our own. In the other galaxy, there’s another Earth where Yamato was unable to launch, and I put forward the proposal that there was a red Earth. The Yamato that’s unable to launch rests there, and Okita is the only person there, in the captain’s cabin. So therefore, Okita appearing again wouldn’t be that weird, I said. Of course, it wasn’t due to misdiagnosis. (Laughs) But it was not adopted in the end. Interviewer: After all the twists and turns, it’s good that you went back to basics with 2199. Izubuchi: Even if it failed, I didn’t want to break the form of the original Yamato. I kept in my head the sound of Okita in Yamato saying, “even if I bring disgrace on myself, I’ll grit my teeth and survive.” Therefore, the parts that deviate keep the good things alive while making adjustments. I thought about how to establish situations without changing the point of the original. Interviewer: What is Yamato to you? Interviewer: So you’re really happy now? Izubuchi: I’m happy. It might be that I have lived for 55 years in order to make this work. There are many people on the staff who lived just as long, and it was the result of multiplying the voices of those who wanted to give distinction to Yamato. While you could say it was distinct, 2199 isn’t over yet.